Designing a shared space for two little girls with totally different personalities is not an easy task. When we first created the girls shared room, they were too little to have an opinion (1 & 2.5). Now, they’re 5 & 7 and have very specific interests, favorite colors and ideas. I created a shared bedroom for my girls when Alex was just a year old. Maggie was in a bed by about 20 months and we thought her little sister would follow suite. 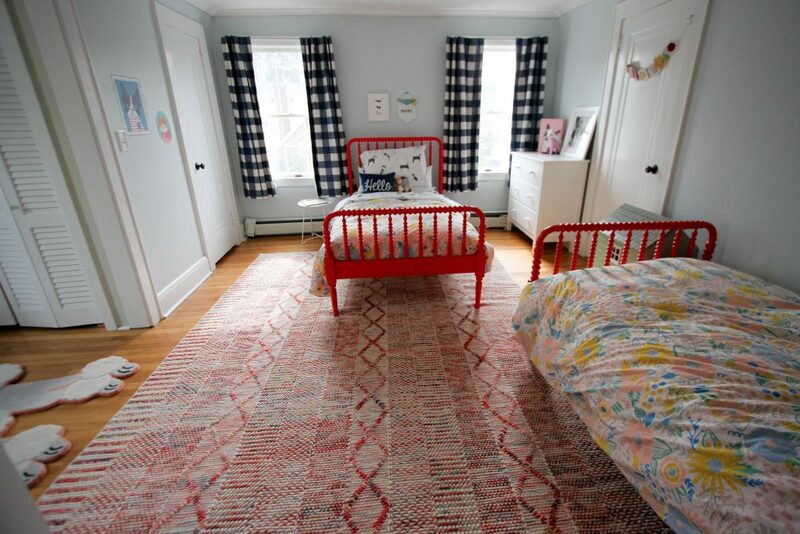 I loved designing their shared room and their raspberry pink Jenny Lind beds are my favorite furniture in our house. They’ve grown up a lot since I first designed their room. We’ve had quite a few nights of the two of them fighting and yelling “when do I get my own room”. Our answer is: when you get a college roommate. While they are not going to get their own room any time soon, I did think their room could use an update and we could incorporate their own individual style into the space while still having it match enough to look nice. 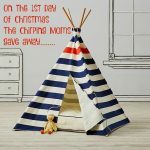 As usual, I turned to the design team at Land of Nod. Their free design service is awesome and I’m always really surprised by how much they help without ever coming to our house. I sent photos, a video of the room and dimensions and they sent along some great ideas. 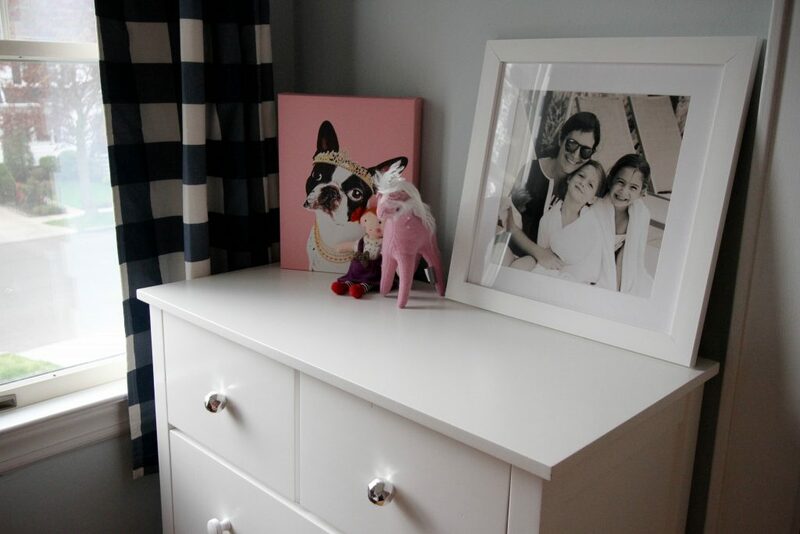 Maggie wanted a dog room and Alex wanted a princess and unicorn room. I was determined to figure out how to create a shared space that looked coordinated and nicely put together, while somehow incorporating the 2 themes. Even after 5 years, our Land of Nod dressers are in great condition. 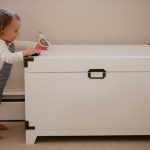 To give them a little “update” we added some fun knobs to the top two drawers of each dresser. This new little reading nook is my favorite update in the room. Both of the girls are reading now and love books. We added this adorable poodle rug to the space, moved their book caddy and added some seating. Then, to make it look more like a separate room, I added some decals to the wall, just in the nook. 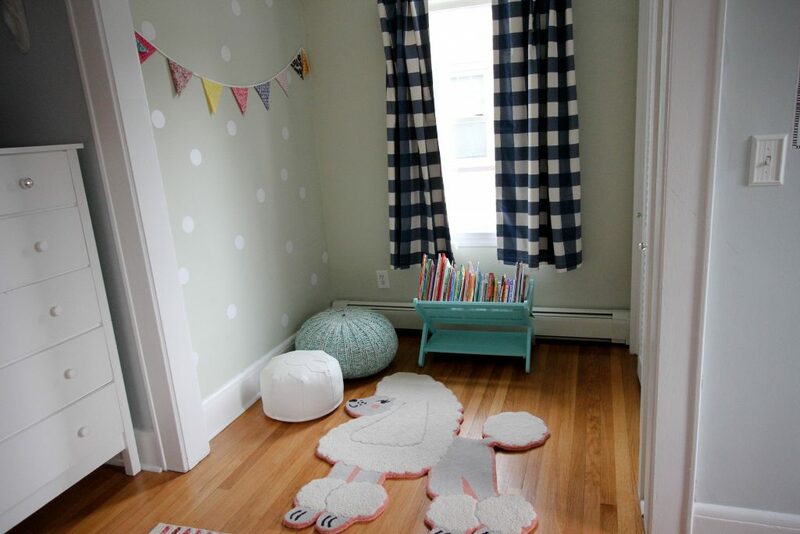 The decals are the Lottie Dot Decals from Land of Nod and they were easy to apply. The girls were SO excited when they saw this little space. This is currently my favorite rug in the house. I went back and forth on which rug to get for their room. A friend (that’s excellent with room design!) suggested that I order a rug sample. I’m so glad I did because I loved the rug so much more in person/ the sample than looking at it online. She also helped me make a decision, because if not I may still be pondering over which rug to get. We have a lot of patterns going on in the room, so it was a tough call. 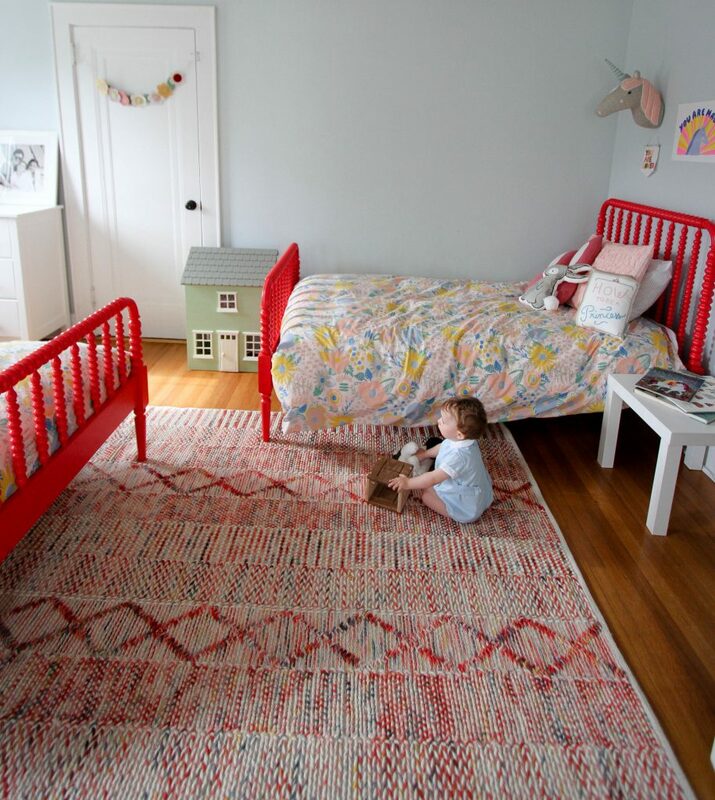 This rug is really well made and will hold up to lots of play. The girls room tends to be where all 4 end up playing every evening, so a quality rug is key here. The girls are liking less pink and more blue these days. 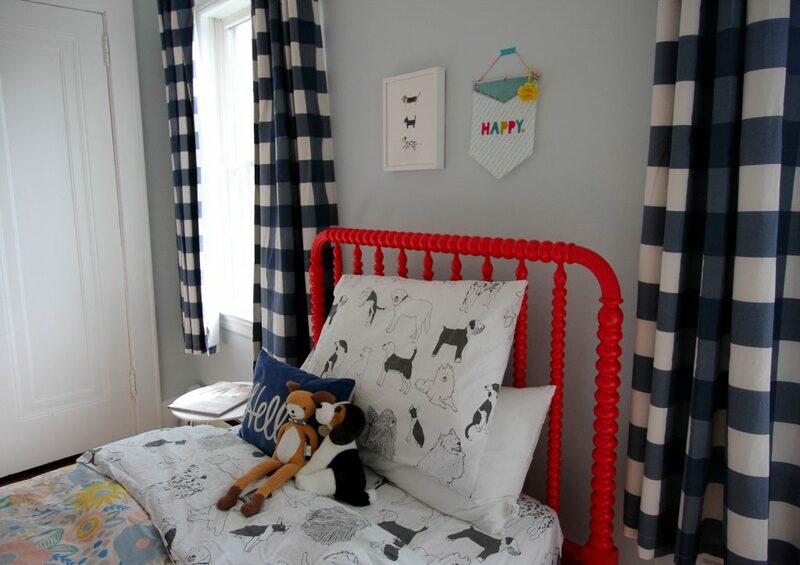 Their pink beds are going no-where, so we went with some very blue, very awesome buffalo check curtains. These are black out curtains and definitely help me maintain early bedtimes even in the bright summer months! Alex was thrilled when she saw the unicorn head for her wall and helped me pick out the “you are magic” unicorn poster. 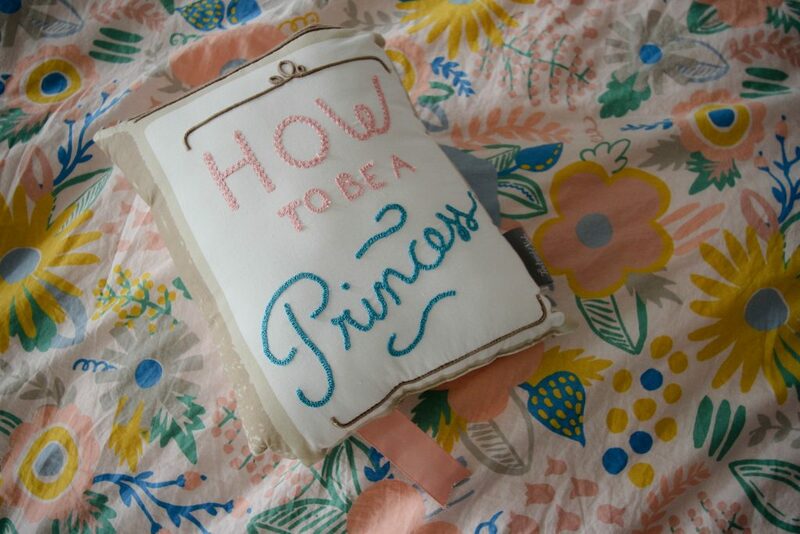 Her “How to Be A Princess” pillow was a special addition to the room, because that’s actually the title of one of her favorite books to read. She reads it to her little brother all the time, to help him work on his manners! This was just enough unicorn and princess for Alex to feel the room fit “her theme”. For her sheets, we went with a pretty Swiss Dot set. 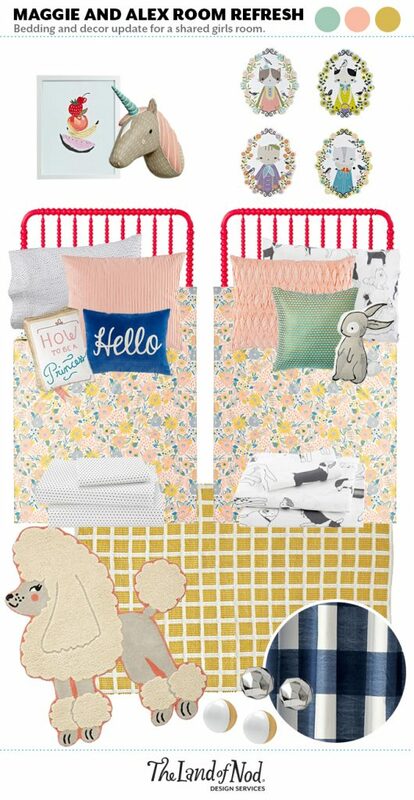 When the Land of Nod team helped me design the nursery, they suggested fun washi tape to hang art in the kids’ rooms. I love how it looks and the less glass and nails in a room where kids jump and bounce around all day, the better. 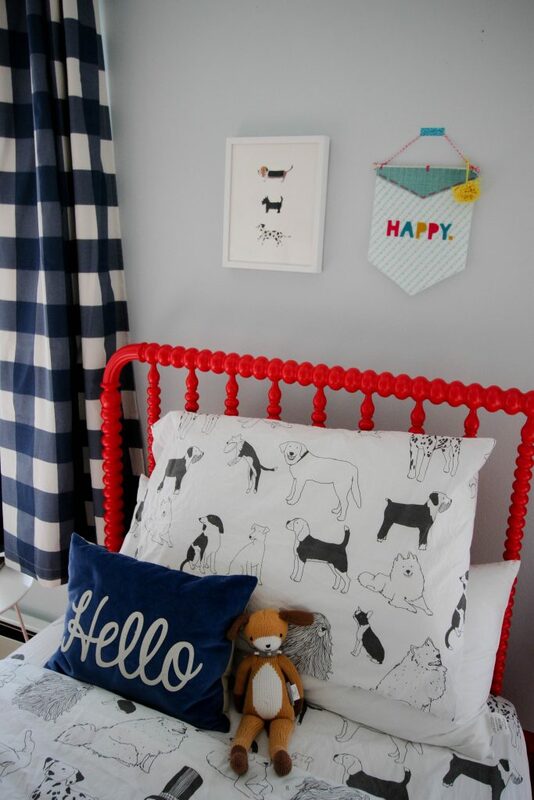 These black and white dog sheets were an absolute hit with Maggie. 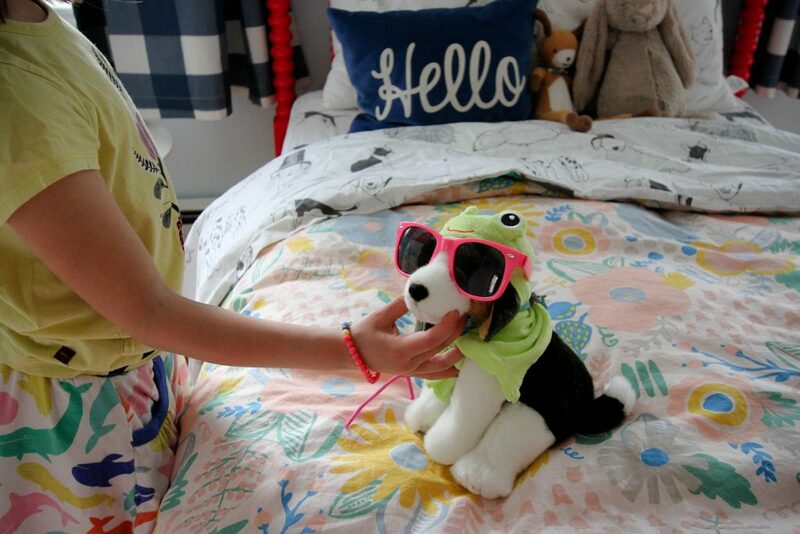 She loves reading about different dog breeds, so sheets with all different breeds is too cool! 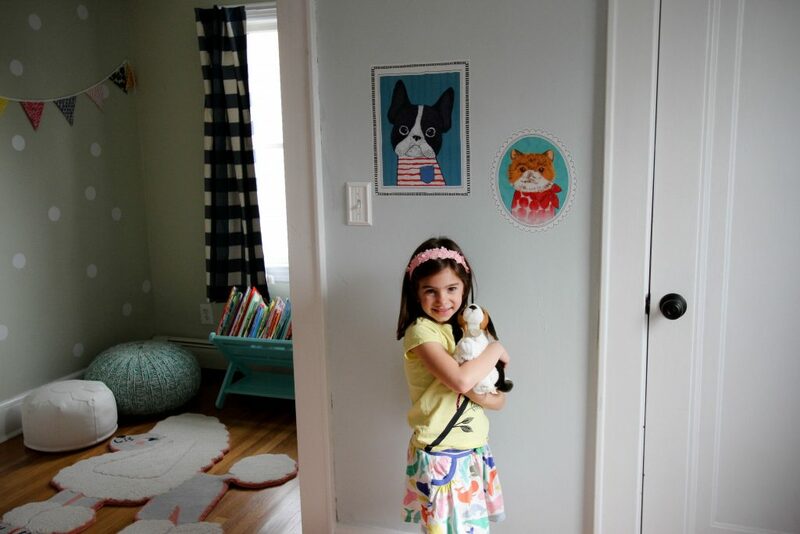 Above her bead we hung a print from Minted and a banner from the Etsy shop, Heartfully Made. We also added some awesome, large animal decals to the wall too. This shared space was a lot of fun to put together. I’m thankful for the help from Land of Nod. They helped us figure out how to arrange the furniture for a shared room both in our old house and new house. They really gave great ideas on maximizing space for 2 kids in 1 room. Their free service is wonderful and I would highly recommend trying it. 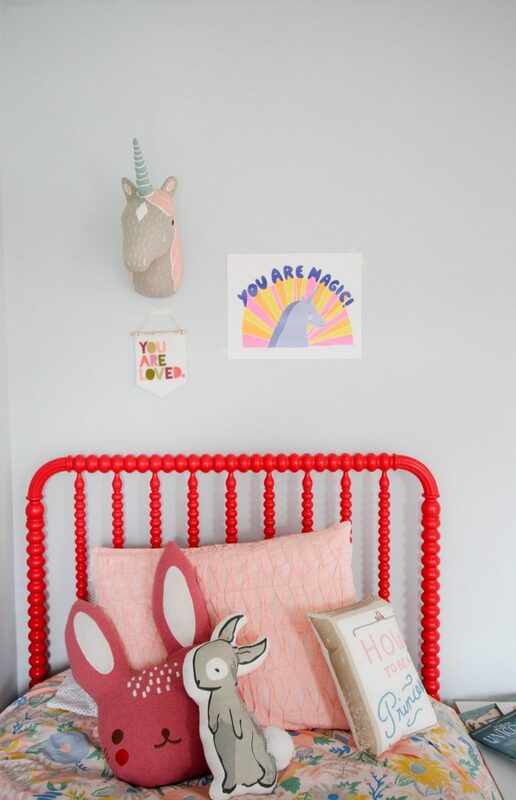 Now to get the girls to sleep in this fun, bright, cheery space! 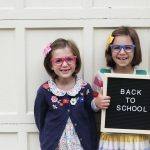 Back to School Styles & $1,000 Mini Boden Giveaway!